Rapid advances in digital sensors, networks, storage, and computation, along with their availability at low cost, are leading to the creation of huge collections of data - dubbed as Big Data. This data has the potential for enabling new insights that can change the way business, science, and governments deliver services to their consumers and can impact society as a whole. This has led to the emergence of the Big Data Computing paradigm focusing on sensing, collection, storage, management, and analysis of data from variety of sources to enable new value and insights. 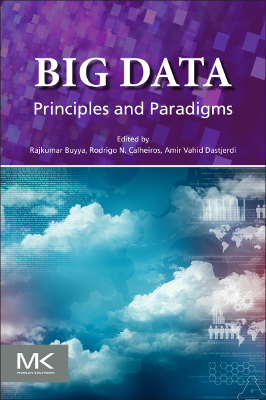 To realize the full potential of Big Data, researchers and practitioners need to address several challenges and develop suitable conceptual and technological solutions for tackling them. These include life-cycle management of data, large-scale storage, flexible processing infrastructure, data modeling, scalable machine learning and data analysis algorithms, techniques for sampling and making trade-off between data processing time and accuracy, and dealing with privacy and ethical issues involved in data sensing, storage, processing, and actions. The primary purpose of this book is to capture the state-of-the-art in Big Data Computing, its technologies and applications. The book also aims to identify potential research directions and technologies that will facilitate insight generation in various domains from science, industry, business, and consumer applications. We expect the book to serve as a reference for larger audience such as systems architects, practitioners, developers, new researchers and graduate level students. Early submission is highly appreciated as the editors would like to have progressive dialogue and work with prospective authors to bring out a book of wide appeal. If we receive more than one proposal for a chapter on the same topic, the editors may request authors to collaborate to develop an integrated chapter. We expect the book to serve as a valuable reference for larger audience such as systems architects, practitioners, developers, researchers and graduate level students. Each accepted chapter should have about 20-35 A4 pages. We expect to deliver CRC of the book to the publisher. A MS Word template will be provided later.